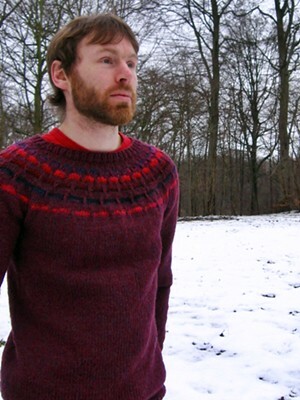 The Boyfriend Jumper - Or Why Do All Male Knitting Patterns Look the Same? In late 2009 I knitted a jumper for David. He wanted a warm, cosy jumper that he could wear all winter round and I was happy to oblige. The only problem was that men's jumpers are generally written for men of a very different body shape to David. I had never really thought about men having similar clothes shopping problems to women, but they do. David is very, very slim - and so I ended up calculating a jumper based upon a women's 36" jumper. However, David has much broader shoulder (and slimmer hips) than an average woman and so I was never really happy with the fit. I knitted the jumper out of New Lanark Aran in the Bramble shade with the yoke details in Noro Kureyon sh 124. David wanted deep, intense colours and that is what he got. Over the years David has worn the jumper a lot - essentially every single day between September and May for four years. It has become his trademark uniform for every knitting show he has attended (and he gets recognised now because of it: look, Mr Bookish in his beetroot jumper!). I have reknitted the ribbing twice - the neckline and the hemline have been particularly prone to fraying - and I have also reinforced the neckline as the yoke has grown over the years. Now the elbows need mending as they are this close to wearing out. I think we have come to the point where I am happy to mend the elbows, but I should perhaps knit David a new jumper so he has another one he can wear day-in/day-out. Me: "You know, I'm really busy with samples but I was thinking that maybe I should try to kni.."
David: "YES! I want a new jumper and I want it to be deep teal but not in a solid way but maybe with a tweedy or heathered feel and then I want red and orange details at the yoke. And then the fit should be slightly different. It is a bit too relaxed around the body and I'd want it to be more fitted too. Look, here's the sort of colour I want but actually a bit darker.."
And at that point David showed me a ball of Rowan Fine Tweed he had found in my stash. Not that he had been waiting to tell me about the jumper he had been plotting in his head. Not at all. We started looking at online yarn shops for the perfect deep teal yarn but eventually we decided upon yet another jumper in New Lanark Aran. David loves the feel of his current jumper and my stash came up with the Raven shade (limited edition shade!). Now we just have to find a pattern for a men's jumper - and this is where I will probably have to sit down to calculate my own pattern. The choice of mens' pattern has improved immensely since I last looked in 2009 but the vast majority of jumpers are still in the "plenty of ease" category and the smallest sizes would simply drown my boyfriend. It's also startling how many men's patterns include cables - unfortunately David loathes cables. Still, I am heartened by designers like Todd Gocken and Josh Bennett who both think men deserve something a bit more modern looking. My good friend Ben Wilson has long been hinting at a men's collection with a modern silhouette - his We All Play Synth pattern isn't quite what I need for David's jumper, but it is much closer than 99.9% of men's patterns on Ravelry. There is definitely room for more patterns of that ilk. Get on with it, Ben! Apropos of nothing, John Lewis Oxford Street is offering men-only knitting classes - maybe that's a sign of a possible sea change? Maybe next time I have to knit David a jumper (2017!) I'll be able to do what's so easy to do with women's patterns: go to Ravelry, type in a few key words and have 500+ patterns to choose from. I hope so. Men deserve better.